Looking for the Best 2018 Soccer ID Camps? Future 500 ID Camps is excited to announce four camps for summer of 2018. These ID Camps provide an unparalleled soccer recruiting opportunity, with over 75 top NCAA Division 1, 2 and 3 colleges in attendance. Future 500 provides an unparalleled soccer recruiting opportunity, with over 75 top NCAA Division 1, 2 and 3 colleges in attendance. Future 500’s innovative blend of on-field matches and off-field educational seminars provide an exceptional opportunity to get recruited while getting educated. In 2017, campers representing 46 US states and 34 countries across the globe showcased their talent at Future 500. All 2018 soccer ID camps will be located in Philadelphia and Daytona Beach. Note: All of our 2018 soccer ID camps offer overnight and commuter options! 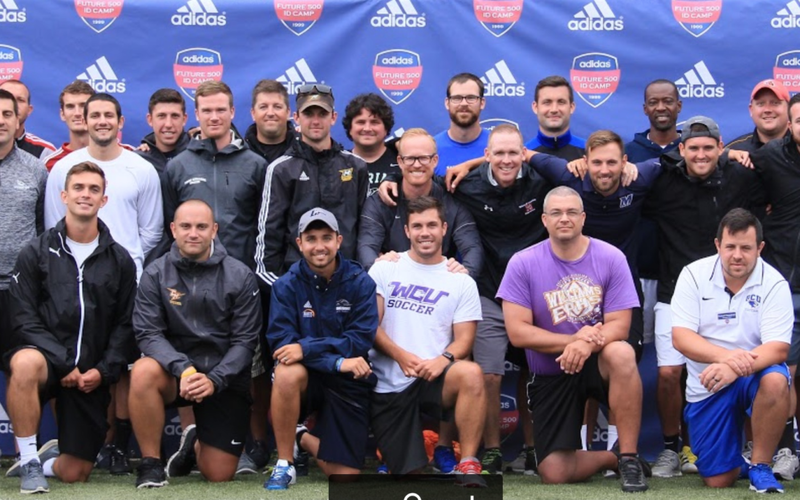 Future 500 ID Camps provide 75 + top academic colleges and universities and nationally-recognized soccer programs representing the best of NCAA Division 1, 2, 3. Future 500 also provides a Maximum Exposure Guarantee for each of our camps. How do we do it? Future 500 spends a tremendous amount of time optimizing the complex schedule-matrix for campers, counselors and college coaches, ensuring that the schedule is highly organized, efficient, strategic and designed for all college coaches to see all campers at least once. If you are considering other ID soccer camps, below are a couple shrewd shopper hints! Hint #1: In our experience, college coaches book their camp plans several months in advance. Carefully count the actual colleges on each page to see if it matches the brand promise, as many camps exaggerate or use old logos. Hint #2: Email the college coach listed, make sure they are actually coming and ask for how long. If actual college coaches are not listed, ask the camp director to provide you the list of which coach is confirmed coming from that camp so you can check for yourself. You want to connect with college coaches ahead of camp to make sure they know you are attending and to keep an eye out for you! Hint #3: If another 2018 soccer ID camp offers a 100 guarantee email the camp director and ask them to show you how they do it. The more colleges per camp, the more complicated that can become. They should be able to answer that question thoroughly and reasonably. Hint #4: Ask how many days the college coaches are attending that camp? At most larger ID camps a college coach will need at least 2 days of camp to watch every team play once. Hint #5: Future 500 ID Camps only advertise the colleges and college coaches that have confirmed (in writing) to attend a specific week of our upcoming camps. Future 500 posts the confirmed colleges and college coaches attending each of our Boys and Girls Soccer Camps starting in January and then updates those pages on a daily basis.